Find out what is going on in the wood, when and what is planned within these pages. We will keep you up to date on conservation tasks, main projects, events and supply you with the resources to discover your wood in a little more detail with wildlife sightings, identification sheets and other educational resources. 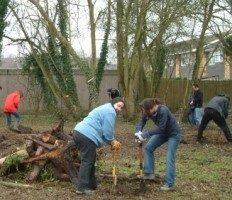 Tongham Community Wood has an ongoing maintenance programme to ensure the wood is accessible and habitats are looked after. This work is carried out by Tongham Wood Improvement Group (TWIG) who hold a conservation task once a month. Dates are listed below and further information can be found in the TWIG pages. The next task date is not set.